Lock in a great price for Holiday Inn Express - Cartagena Bocagrande – rated 8.6 by recent guests! Clean just like the US counterparts, hot water, free breakfast. The staff is amazing, they all are friendly and they care about you as a customer. Perfect location. Near food places and about 5 mins from wall city. If I go back to Cartagena I will stay here again. Great location. Plenty of options for food and to go out for a drink. Very close to the beach. Location is great, close to Restaurants and bus line!!! The Parking facilities was nice. The staff was very friendly. Almost everything... A nice and modern room, Nice facilities, Great location, Very nice and polite stuff that speaks English, Good buffet breakfast, And all of that in a very good price, it cost me about 80$ a night. I paid almost the same amount for an hotels with much less !!! Loved the breakfasts! Enjoyed room cleanliness! Most of all the front desk staff are amazing! Very nice front desk staff, room was perfect oh the bed and pillows put me right to sleep. Location. Breakfast include. Price of the room good. Friendly. 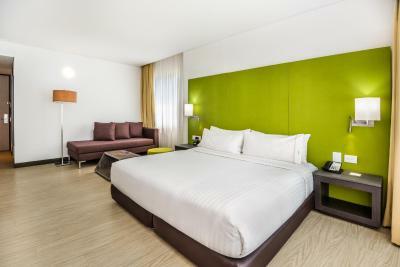 Holiday Inn Express - Cartagena Bocagrande This rating is a reflection of how the property compares to the industry standard when it comes to price, facilities and services available. It's based on a self-evaluation by the property. Use this rating to help choose your stay! One of our top picks in Cartagena de Indias. Offering an outdoor pool, Holiday Inn Express Bocagrande is located in Cartagena de Indias. Free WiFi access, a business centree and free private parking are available. Each room will provide you with a cable TV, air conditioning, and a coffee machine. Private bathroom also comes with a shower. You can enjoy city view from the room. At Holiday Inn Express Bocagrande you will find a fitness center, a tour desk and luggage storage. If you feel like visiting the surroundings, check out Cartagena's historic Walled City, just 5 minutes away by car and the Julio Cesar Turbay Convention Center 1.9 mi away. Rafael Nuñez International Airport is a 15-minute drive away. When would you like to stay at Holiday Inn Express - Cartagena Bocagrande? House Rules Holiday Inn Express - Cartagena Bocagrande takes special requests – add in the next step! Holiday Inn Express - Cartagena Bocagrande accepts these cards and reserves the right to temporarily hold an amount prior to arrival. Please note for reservations of more than 5 rooms a 50% deposit must be made to secure the reservation. Would be cool to have more variety in breakfast, the bathroom in our room was too small but I believe there are rooms that have bigger ,some staff to speak better English and check in process to be more modern but in general for Latin America is an amazing place to stay for short vacation ! The staff need to be re trained in customer service and be taught how to smile especially the front desk people. 1. Toilet was very noisy 2. The pool wasn't clean 3. Breakfast was average, I couldn't eat waffles because it takes at least 2:50 minutes to make it and the line was long. 4. The staff was very slow. Each time I went to the lobby they took their time to answer my questions. Also in an opportunity, I call them from my room to ask something and the staff told that I had to go to the lobby, so the phone was completely useless. The History of Cartagena....Ciudad Vieja. I am allergic to feathers, the only pillows were feather, soft or firm. The staff was great, very helpful and friendly. Comfy beds, great bathroom, pool and gym. Very good accommodations. Staff was very helpful.